Days of Future Passed might not have been The Moody Blues’ debut recording, but it did mark the dawning of a new era for the band by laying the foundation upon which it was able to construct an extraordinarily lengthy career. Founded in 1964 by harmonica player Ray Thomas and pianist Mike Pinder, the original incarnation of the collective also featured guitarist Denny Laine, drummer Graeme Edge, and bass player Clint Warwick. Despite scoring a major hit with a cover of the R&B tune Go Now — which it was able to parlay into support slots on tours with Chuck Berry, The Kinks, and The Beatles — the ensemble struggled in its efforts to craft a follow-up single, and its subsequent full-length debut The Magnificent Moodies bombed miserably. As a result, Laine and Warwick departed, though they quickly were replaced respectively by Justin Hayward and John Lodge, thereby putting the final pieces of the group’s classic line-up into place. Initially, the refurbished rendition of The Moody Blues continued to mine British Invasion-style fare, but as the market shifted direction and as the band matured, it began to turn its attention toward penning psychedelically artful, folk-pop songs. This transformation is detailed most extensively on the hodgepodge collection Prelude, which compiled into one album the collective’s post-Laine, pre-Days of Future Passed recordings as well as several late ’60s studio leftovers. Yet, the best example of this transition is, perhaps, contained within Peak Hour, a song that concluded the first act of Days of Future Passed and effectively united The Beach Boys’ bright surf sounds with The Who’s rough and rowdy, R&B-flavored turf. 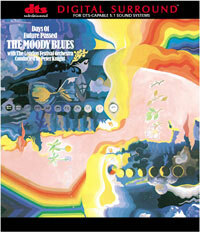 Still, it was Decca Records that fully sealed The Moody Blues’ fate. The label already had lost a significant amount of money by promoting the ensemble’s failed endeavors, and in trying to salvage a dismal situation, it approached the group with a proposal to adapt Dvorak’s 9th symphony From the New World for a rock-oriented audience. Meant to demonstrate Decca’s new, enhanced stereo technology, the project quickly evolved into something far more ambitious when the band saw an opportunity that it couldn’t resist exploiting. 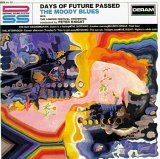 Released in December 1967, Days of Future Passed instantly became The Moody Blues’ signature work, and although many have called it an overly pretentious affair, there’s little doubt that no one since has been able to concoct such an exquisitely cohesive, conceptual work. Utilizing the passage of time as its guide, the song cycle portrays a cautionary tale about the brevity of life, though its lyrics also are laced with the spiritual underpinnings of a psychedelic pilgrimage as well as those of the circular journey from birth to death to reincarnation. The structure became a blueprint of sorts for The Moody Blues’ subsequent efforts — In Search of the Lost Chord, To Our Children’s Children’s Children, On the Threshold of a Dream, and A Question of Balance all expounded upon the core themes that drifted through the outing, although musically, the ensemble abandoned the actual employment of an orchestra in realizing its visions — and in 1973, Pink Floyd responded with a much darker examination about the nature of human existence. Given the inherent theatricality of Days of Future Passed, it certainly isn’t a surprise that the effort functions so well in its re-christened rendition as a sparkling, DTS 5.1 surround sound masterpiece. Yet, the result is still more stunning and powerful than one might imagine, simply because such tremendous care seemingly was taken to preserve the original intent of the material while also placing it in an entirely new context. The listener quite literally is situated within the confines of the epic soundtrack, and its wide-sweeping atmospherics unfold much like those of a Broadway play. The gong that opens and closes the collection floats across aural spectrum, while the beatnik poetry recitations by Mike Pinder creep dramatically from the rear of the venue. Elsewhere, the playful, circus-like atmosphere of Ray Thomas’ Another Morning is brought to the forefront; the chaotic rush of the workday is frenetically encapsulated within Peak Hour’s crisp, symphonic overture; the bridge to Forever Afternoon (Tuesday?) is reflected more dramatically in its front-to-back incarnation than it was in its side-to-side stereo counterpart; and Twilight Time features tremendous separation between the vocals and the music, turning the composition into an even grander psychedelic experience. Indeed, the reconfiguration of Days of Future Passed breathes new life into an album that nearly was sucked dry by the redundant regurgitation of classic rock radio, but even if such a monumentally magnificent presentation was only a dream at the time of its original creation, it sure sounds as if this was exactly how the outing always was meant to be heard.